Police should have ended the Sydney cafe siege as soon as the hostage-taker began shooting, an inquest has found. In December 2014, gunman Man Haron Monis held 18 people hostage inside the Lindt cafe until police stormed the building 17 hours later. A coroner on Wednesday ruled it was a "terrorist incident" for which Monis was solely responsible. But he found authorities had made major errors, including by delaying entry, during which time a hostage was killed. Cafe manager Tori Johnson was killed in the 10 minutes between Monis firing his first shot and police storming the building, New South Wales Coroner Michael Barnes said. Heavily armed officers shot Monis dead, but stray police bullet fragments killed a second hostage, barrister Katrina Dawson. New South Wales Police Commissioner Mick Fuller conceded police "should have gone in earlier", in an interview released after the coroner's findings. Mr Barnes ruled police were ill-equipped to handle the siege, relied too heavily on a sole psychiatrist, and employed a "contain and negotiate" strategy which failed. He also savaged an earlier decision allowing bail to Monis, who had been charged with 43 sexual assaults and being an accessory to his ex-wife's murder. a 10-minute delay between Monis firing his first shot and police entering the building, allowing Mr Johnson to be "executed in the meantime"
having some confusion around the lines of command. Mr Barnes said a prosecutor had given inadequate information when Monis faced an earlier bail hearing over his ex-wife's murder. "That [prosecution] solicitor erroneously advised the court that Monis did not have to show exceptional circumstances before he could be granted bail on the murder charges," Mr Barnes said. Monis, an Iranian-born Australian citizen, had pledged allegiance to so-called Islamic State (IS) not long before the siege. "It remains unclear whether Monis was motivated by Islamic State to prosecute its bloodthirsty agenda, or whether he used the organisation's reputation to bolster his impact in pursuit of his own ends," Mr Barnes said. On Monday, the families of Mr Johnson and Ms Dawson criticised a police command tactic to intervene only if the gunman killed or injured someone. "I'll never be able understand how you can make a calculated decision that you wait for someone to die," Mr Johnson's mother, Rosie Connellan, told the Australian Broadcasting Corp (ABC). In an ABC interview released on Wednesday, the police chief said it had been "wrong" to wait 10 minutes after Monis first fired his shotgun. "There is an expectation from the community, and I think it is a fair one, that we will show force in those situations in future," Mr Fuller said. 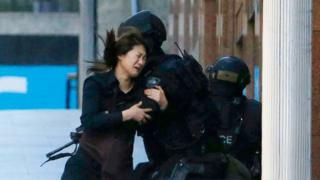 In the words of the coroner, the Lindt Cafe siege was a moment when "Australia held its breath as torture played out across the day". But for the victims' families, the wait for answers and an admission of failings has only added to their torment. By conceding his officers should not have allowed 10 minutes to pass after the first gunshot, the New South Wales police commissioner has finally taken an important step. It confirms to the families, the hostages, and the public that the police were at times confused, and did not always react to the events unfolding in front of them. But it is an admission that could only be made with the benefit of hindsight, and with the intention of learning from the tragedy. As the coroner said, while it is important not to paper over mistakes, it is Monis who deserves to be the focus of denunciation. After the findings, Mr Johnson's partner, Thomas Zinn, said he still had respect for police despite the "failures of various authorities". "The pain deep in our hearts from losing Tori is as strong now as it was in December 2014," he said. "Everybody who knew Tori would agree that we lost a guardian angel that night." The state's police union had criticised the inquest as a "witch hunt" that had scrutinised police officers "as if they were on trial". "For some lawyers the focus appeared to be not just to attribute blame but moral culpability, twisting words to belittle experienced officers," New South Wales Police Association acting chief Tony King wrote earlier this week. Mr Barnes acknowledged the police response carried extreme risk, and stressed his findings were specific to this incident. more effective sharing of information between government agencies. "I am acutely conscious that systemic improvements will do nothing to alleviate the grieving for Katrina and Tori that their loved ones will continue to suffer," Mr Barnes said. "I am powerless in that regard."